Health officials say a simple skin test can detect tuberculosis, a disease caused by a germs spread from person to person through the air. Tuberculosis remains a silent epidemic in much of the world and still touches the lives of Navajo people. From a high of 200 cases of TB on the Navajo Nation in 1955, there were 17 cases in 2009 and 26 cases in 2010, according to Sarah Yazzie, TB coordinator at the Gallup Indian Medical Center. In recognition of World TB Day, which is observed on March 24, tribal and state public health officials are collaborating to present information throughout the month about the disease, which can be cured if caught early. "The key is to make sure someone is diagnosed soon enough to be treated," said Diana Fortune, acting TB manager for the state of New Mexico. "You can die from it if you're not treated." TB, which is a communicable disease caused by bacteria, is spread through the air from person to person. However, a person has to spend a significant amount of time with someone who has TB to contract the disease. "You have to spend hours and hours of time for you to become infected yourself," said Fortune. Some symptoms are coughing up blood, fever, chest pain, feeling tired or weak, night sweats, weight loss and lumps in the neck. 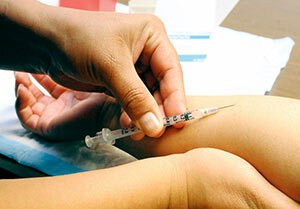 Persons experiencing any of those symptoms should have a mantoux tuberculin skin test, said Yazzie. "The TB skin test tells you if the tuberculosis bacteria are in your body," she said. If a person's TB skin test is positive, it means that they may have been infected with the tuberculosis bacteria. More tests such as chest X-rays are needed to find out if they have TB disease, said Yazzie. "Patients with tuberculosis used to face treatment for long periods of time away from their homes - 6 months, 9 months and 12 months," said Yazzie. "Today, we don't have to send people away to sanitoriums. People are being treated at home." "Some patients who do test positive for the TB bacteria don't feel sick and are not contagious," said Fortune, explaining that some people have a latent TB infection. "They may become sick if the bacteria becomes active in their body. They should consider treatment for latent TB infection to prevent active TB disease." "People who are getting treated for latent TB infection can continue their daily routines because they do not feel ill," said Fortune. "They can be on the job and take care of their families." Patients who are successfully treated for latent TB infection "know they have protected themselves and others possibly from TB," said Fortune. "Treating TB infection is a plus because the bacteria are killed off before the illness can progress." TB technicians like Zena Arviso are available to ensure those being treated at home take their medication as prescribed. "We're like Annie Wauneka educating Navajo people about tuberculosis," said Arviso. She logs in up to 3,000 miles a month assisting and observing patients taking their medication in their homes to prevent the spread of the disease. Arviso, like other TB technicians, staff education booths at chapter houses and health fairs. They also administer TB tests to people in high-risk situations such as jails, detoxification centers and nursing homes. Some people who should be tested for TB are those with diabetes, HIV/AIDS and kidney disease. In addition, people who have been in contact with someone who has TB, are on dialysis, are underweight, are on medication that suppresses immunity or if they've had an organ transplant are encouraged to get tested. "There's a TB program at all IHS and '638 programs," said Yazzie. "We do have a staff at all IHS under the Navajo Nation TB program and a physician who works with TB at each IHS site." "It's OK to come forward if you're experiencing any of the symptoms of TB," said Fortune. "We've done away with the stigma associated with TB. We want people to feel comfortable and get tested."